The weather may have been all over the place last week but it was certainly on our side for Critical Mass last Friday. Since Critical Mass is very much on the side of the environment this only seems fair. Thank you to the weather gods! And when the sun is out we surely should be making the most of it. Cycling the Mass in the sun can be so much fun – there is a certain relaxed freedom and joviality that many of us struggle to find cycling in a city – and so in spite of the fun we did have I did find myself asking where everybody was this month? We did have a healthy crowd of about 30 cyclists, which is awesome, as it means I get a chance to speak to pretty much everybody. But surely there are more than 30 cyclists in Edinburgh who are not satisfied with the state of the cycling infrastructure. In May last year we saw about 70 riders and that was great fun. 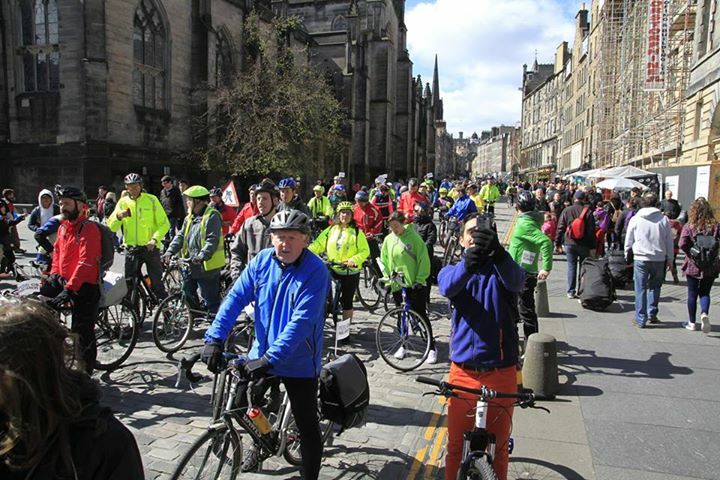 And in april this year there were literally 1000s of us out on our bikes on a sunny day for the annual Pedal on Parliament. But is turning up announced at Parliament once a year going to enough to make our roads more cycle friendly? We need to get together more often, throughout the year, in all conditions, and also turn up unannounced when there aren’t cameras and people don’t have prepared speeches. And that is what Critical Mass is about – a non-hierarchically organiased ride where everyone has a voice, everyone is welcome, and we pedal about wherever we please asserting ourselves peacefully (see our FAQs for more). Last Friday’s ride took us all over our beloved city – through quiet streets, through busy streets, through famous streets, and although we inevitably pissed a few people off (simply because we’re cyclists and not because of the way we ride), we got a lot of love, as ever, from motorists and pedestraians (here is a wee video). At the end of the day we are a peaceful protest and people feel that and are generally very supportive. So why don’t you join us next time – 26th June is our next ride. We do this every month – every ride is different – different streets, different faces, and different sounds.